eToro Review | Does it pay to copy expert forex CFDs traders? Established in 2006, eToro is a multi-asset online brokerage and the leading social trading platform in the industry. eToro facilitates both traditional and social trading in currencies (Forex), Exchange Trades Funds (EFTs) and Contracts for Difference (CFD’s) in commodities, indices, stocks and crypto currencies. Currently, eToro has around 6 million users in more than 170 countries and significant numbers of new traders signing up every day for the potentially profitable social trading experience. A key point about eToro is that social trading is not mandatory. Traders who wish to trade on their own can do so, with a broad range of tools and instruments provided on the trading platform. Whilst eToro has offices in Israel, Cyprus and England, the European headquarters are based in Limassol where the company is licensed as a Cypriot Investment Firm and regulated by CySEC. UK operations are based in London with the authorisation of the FCA and both the UK and European registered companies comply strictly with MiFID rules applicable across all EU countries. eToro accepts New Zealand traders. 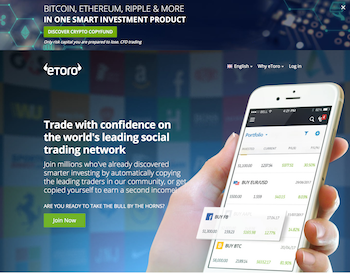 To create the social trading environment, eToro allows traders to watch and copy leading traders on its proprietary electronic platform. The idea of social trading is to use ‘crowd-wisdom’ to get a better understanding of online trading strategy, with the aim of increasing investment returns to less experienced traders in the eToro community. Significantly, eToro claims that copied trades have had an 80% success rate since the launch of eToro social trading. eToro is available in 13 languages and invites clients to open a straightforward trading account and then decide on whether they want to use the virtual portfolio to practice without risking real money or to activate a live trading account by making a minimum deposit of $50. Notably, the minimum size of a transaction after leverage is 1,000 units in either the virtual or real money portfolio. We were impressed by the possibility of switching between the virtual and real money portfolio at will, allowing traders to apply what they learn as they go along, to real money trading situations. The free practice account at eToro is incorporated into the standard trading account as the Virtual Portfolio. The button is located next to the Live Portfolio tab when you register an account. The virtual/practice account replicates live trading in real market conditions. Indeed, the only difference is that traders are given virtual money by eToro to use for practice and any profits are not withdrawable. The practice account includes the powerful copy trading feature, so that clients can learn how to build a people-based portfolio and follow their trading activity. Significantly, experimenting with the virtual portfolio gives traders the same experience as they would have from live trading without withdrawing eventual profits. Notably, this includes copy trading, as well as access to all the financial instruments and trading tools. The limitations on leverage vary at eToro depending on the type of financial instrument traded. Nevertheless, the minimum transaction size after leverage is 1,000 units. Leverage for Forex trading is between 1:50 and 1:400. The maximum for Stocks is 1:10, for Commodities and Indices 1:100 and for ETFs 1:5. eToro gets its revenue from the spread on each position, which is the difference between the Ask and the Bid price. At eToro, the spreads are from 2 pips. The eToro Trading Academy is a comprehensive education centre providing easy-to-understand information for becoming a financial trader. There are free video tutorials, webinars and plenty of articles to help traders irrespective of whether they have experience or are just starting out. eToro is the ‘one-size-fits-all’ trading platform accessible by traders registering an eToro account, even in New Zealand. This newly launched social trading platform combines all the features of the legacy OpenBook social platform with the original Web Trader platform used for portfolio management at eToro in the past. With the vastly improved, unique eToro trading platform, traders have the flexibility to invest according to their personal preferences in a broad range of investment solutions. eToro platform features include charting software, live rates, stop loss and take profit orders as well as the possibility to change trade settings and manage copy trading. The powerful Copy Trader feature has made eToro an iconic social trading platform in the financial trading industry. 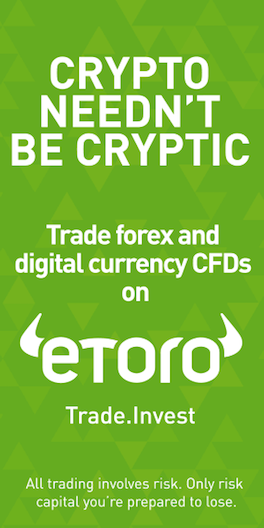 Importantly, it costs nothing to use the Copy Trader and allows anybody registered with eToro to follow the trading activities of successful individuals. If they like what they see, they can copy the trades automatically in their own trading accounts. Moreover, less experienced traders can ‘attach’ themselves to the most successful traders and replicate trades automatically whenever their chosen leaders execute trades. To manage the risk of unsuccessful trades, copy traders can set the Copy Stop Loss on each copy trade position. eToro claims that since it launched the Copy Trader, 80% of trades copied by their clients have been successful. Traders at eToro who would like to be included to the Popular Investors Program need to deposit $1,000 or more and have at least one follower copying their trades. The Popular Investors Program rewards participants with up to $10,000 a month in commissions and rebates, proving an attractive incentive for successful traders. Importantly, the money earned from the Popular Investors Program is in addition to trading profits. The eToro mobile app is free for iOS powered devices in the Apple App Store and in Google Play for Android powered devices. With the eToro app, clients can keep track of their trading activities from their phones, with access to multiple trading tools including live rates and charts. Notably, traders can open and close positions on the move as well as connect with fellow traders, following news and discussions between peers. Live support in several languages is provided by the eToro customer support team 24/5.  Notably, trading hours are from Sundays 10 pm GMT until Fridays 9pm GMT but customers can access their accounts 24/7. We saw a live messaging service on the interface with instant replies and a ticket system where customers send written enquiries and wait for a response. Notably, eToro advises clients that the response may be delayed due to the growth of the customer base, a poor excuse in our opinion. Nevertheless, we found the vast amount of information available on the website may answer most questions client’s may have about eToro and setting up a trading account. As long as all the required documents are provided when requesting a withdrawal, the request is processed within 1 business day. However, it can take several days to receive the funds as this depends on the payment provider. Importantly, every withdrawal request is charged a processing fee of $25 and a currency conversion fee if the withdrawal is not made in USD. Separate fees may be charged by the payment provider for each transaction, independently of fees charged by eToro. Importantly, eToro securely segregates clients’ funds in tier-1 international banks and implements advanced SSL encryption software to protect customers from internet fraud. We were pleased to see that eToro is an ethical broker, protecting clients’ privacy and not sharing customers’ personal data without prior permission. eToro does not accept customers resident in the USA.